Investment banking is back! After a rocky few years, to say the least, major Wall Street banks are once again making huge amounts of money from bond trading, a traditional cash cow. In the third quarter, revenue from trading in fixed-income securities and similar products was up at least 30% year-over-year at each of the biggest US investment banks. JPMorgan, for example, recorded a 48% increase in bond-trading revenue, to $4.3 billion, in the quarter. But you won’t see the banks celebrating this too much. Instead, bank bosses have taken a self-deprecating tone when discussing their buoyant bond-trading businesses. Mostly, they say the recent jump was flattered by comparisons with weak results in the same period last year. 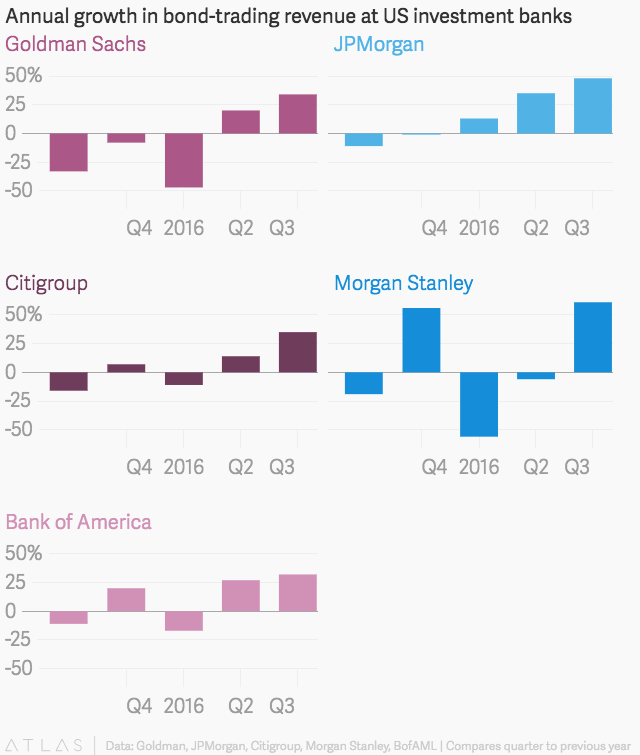 For good measure, Gorman of Morgan Stanley said the thing he was “pleased” about was that the bank’s performance came ”with 25% less people.” That may be harsh, but it acknowledges the wrenching restructuring investment banks have undertaken in recent years, mainly by cutting staff and shrinking their balance sheets. Despite their strong results, you can understand why the big banks don’t want to gloat. After their industry imperiled the global economy in 2008, soaking up trillions in taxpayer bailouts in the aftermath, banks aren’t as keen as they once were to highlight their money-making prowess. And so investment bankers—the ones that are left, anyway—are keeping their heads down.